In addition to painting portraits, Jørgen Roed also enjoyed working with subjects that often depicted everyday situations instead of functioning as actual stories. In this idyllic scene from a Danish forest, the artist has depicted a forester conversing with a lumberjack. The lumberjack is pointing at one of the birch trees, presumably discussing with the forester whether it should be cut down, while holding his axe close to his body. 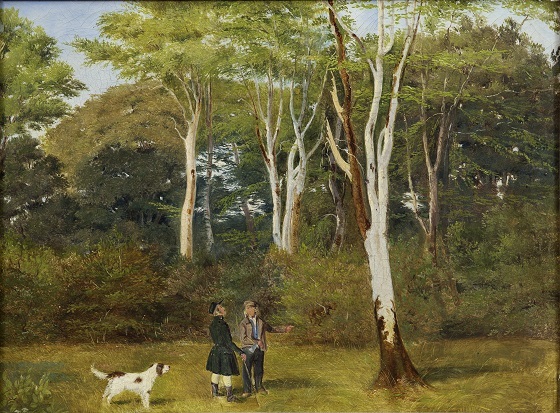 With a raised head and thoughtful expression, the forester is closely examining the tree, while his dog waits obediently by his side. The entire composition is rendered in a light and vibrant colour scheme, underscoring the idyllic summer atmosphere.